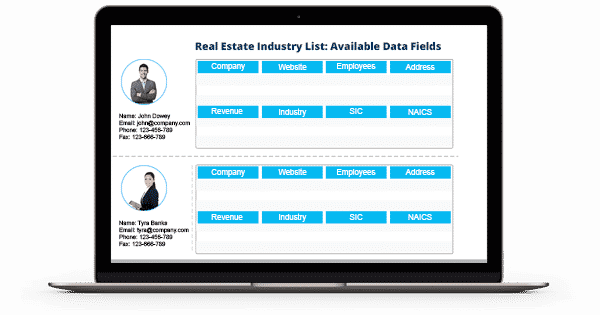 Looking for reliable marketing database to connect with real estate agents, brokers, contractors, key decision makers, and professionals? Blue Mail Media provides marketers with qualitative Database of Real Estate Agents Email Lists, Real Estate Business Email List, Real Estate Mailing Lists and Real Estate Telemarketing List. Our database will allow you to explore newer opportunities in the real estate and construction space and significantly boost your multi-channel marketing campaigns. With Blue Mail Media’s Realtor Email Database, you can connect with your most valued prospects via telephone, email or mail. Whether you wish to market your products, solutions, and services in USA, UK, Canada, Europe, Asia, North America, Australia or any other major country, Our Real Estate Email Database is sure to help you gain superior results on your marketing campaigns. Blue Mail Media’s Real Estate Agent Email List has been created putting a significant amount of time and efforts put into the collection, verification, update, and organization of data so that marketers can achieve more on their marketing campaigns and realize greater conversion rate. As each business has a unique set of challenges and priorities. This is why we offer you pre-packaged Real Estate Industry Email List as well as customized mailing list that aligns well with your organization specific marketing objectives. There are immense opportunities for business organizations who are involved in Real Estate development as well as those who provide ancillary services around the same. However, for marketers to make the most out of this real estate growth trajectory, competent and reliable data is a must. This is where Blue Mail Media comes as an enabler. Our Realtor Email List has been designed to help you flawlessly execute your marketing campaigns with complete information to reach your prospects via telephone, email or mail. We have a strong data partners network spread across all major real estate markets, which enables us to serve you in a glocalized manner- global yet local. Also, we house a proficient team of data experts, analysts, and technology geeks who ensure our database is accurate, result-oriented and bring you better than expected success. 1. How accurate and reliable is your Real Estate Industry Email List? We provide 85-95% of accuracy in our Real Estate Industry Email List. Along with it, our list also offers 90% of deliverability rate. Our team of data scientists verifies and updates the list every 90 days. 2. Do you offer a customization option for Real Estate Email List? Yes. Our Real Estate Industry List is offered in both prepackaged and customized format to meet your business needs. You can segment the data based on various factors such as SIC code, NAICS code, geographical location, company’s revenue and other. 3. Can I use Real Estate Industry Mailing List to target the businesses worldwide? Yes. You can use our Real Estate Industry Mailing List to reach all the top-notch decision makers and executives in various regions across the globe. It includes- the US, the UK, North America, Canada, Europe, Australia, Middle East, South Africa, Asia, and many more. 4. Which are the different data sources you use for Real Estate Mailing List? We have an expert team of data analysts who gather the data from highly authentic and international sources such as government records, yellow pages, surveys, business directories, trade exhibitions, conferences, meetings, and other. 5. What are the information’s I get from your Realtors Mailing List? We provide all the essential marketing information in our Real Estate Industry Email Database. It includes- first name, last name, company, job title, revenue, company size, phone number, geographical location, web address, SIC code, NAICS code, and more. 6. Does your Real Estate Industry List obey GDPR and Anti-Spam law? Yes. Our Real Estate Industry Email List rigorously follows the guidelines of GDPR and Anti-Spam law. 7. In which format do I receive my Real Estate Industry Mailing List?